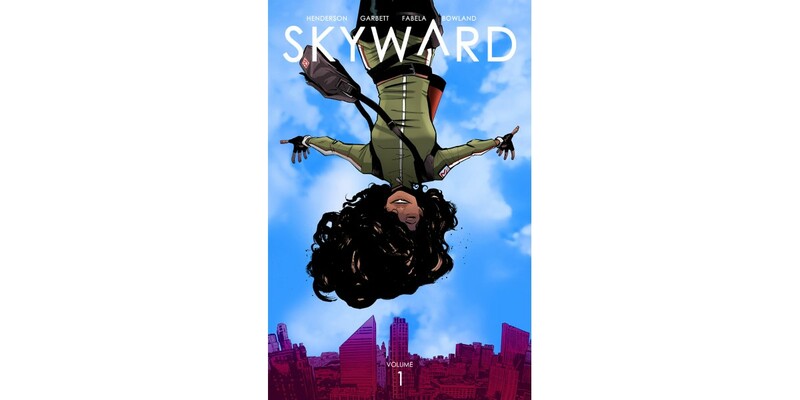 PORTLAND, OR, 6/19/2018 — The first story arc of the critically acclaimed, gravity-defying SKYWARD—by writer Joe Henderson (showrunner of Fox’s Lucifer) and artist Lee Garbett (Lucifer, Loki: Agent of Asgard)—will be collected into trade paperback and available this September. SKYWARD, VOL. 1: MY LOW-G LIFE will include issues #1-5 of the series. SKYWARD, VOL. 1 trade paperback (ISBN: 978-1534308336, Diamond Code JAN188542) will hit stores on Wednesday, September 19th and bookstores on Tuesday, September 25th. The final order cutoff for comics retailers is Monday, August 6th. It can be ordered on Amazon, Barnes & Noble, Books-a-Million, IndieBound, and Indigo.